Our J-30I has stopped reading rotors. I've tested speeds upto 10k RPMs on a JA-20 but after multiple attemps the rotor was never indentified but we had no errors either. I've tried the JA-20 and a JLA-16250 rotor with no luck. I've cleaned the inside surfaces as well but still nothing. Is this a sensor issue or something else? Edit: i tested the fuse on the sensor cable and it tested good. Edit 2: I went ahead and followed the steps you laid out earlier about setting up the Windage and Interia. I reset the elevation, adjusted the ambient pressure to match, set the p4 value that was on the sticker. I used a JA-20 rotor for the windage and interia but the unit failed the automatic calibration. It listed the error as "R0 invalid calibration values" with a rotor error on the right side. The unit now sucessfully indentifies the JLA-16250 rotor but indentifies the JA-20 as a JA-20.1. Is this mismatch a serious concern? Or can the centrifuge be used like this? What is the age of your J30I. The earliest I models had the Indala rotor ID system built into the chamber door of the centrifuge. 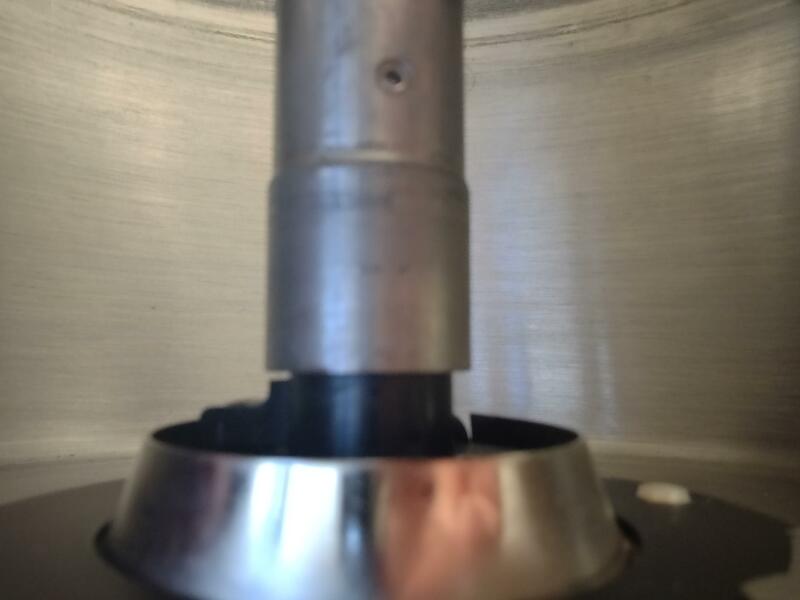 If you see a black cable coming out of your centrifuge door down into the chassis then that is the type of sensor your centrifuge has in addition to the rotor ID system that is found underneath the drive spindle. The Indala system was problematic at best and sometimes it just did not work at all. The other issue MIGHT be the spacing of the rotor ID sensor beneath the drive spindle. That spacing should be 0.040 inches. Does your JA20 rotor have magnets in the bottom of the rotor and does it have a large plastic knob to secure the rotor because that is where the Indala sensor is located? Sorry but I have to ask if I'm going to be able to help and I assume nothing. In my 17 years of working on Avanti J's I never had a rotor ID sensor ever fail outright but that is not to say that it could not happen. Get back to me when you can. I'm not sure how old the centrifuge is since we bought it 2nd hand. Is there a date sticker somewhere on the unit I can look for? From the description it seems like we do have the Indala rotor ID system. Is there anything I can do to improve it? I've included some pictures of our JA20 rotor with the lid along with the cable that I see. Let me know if you have any problems with the pictures. Unfortunately the pictures did not show up as a link that I could click on. 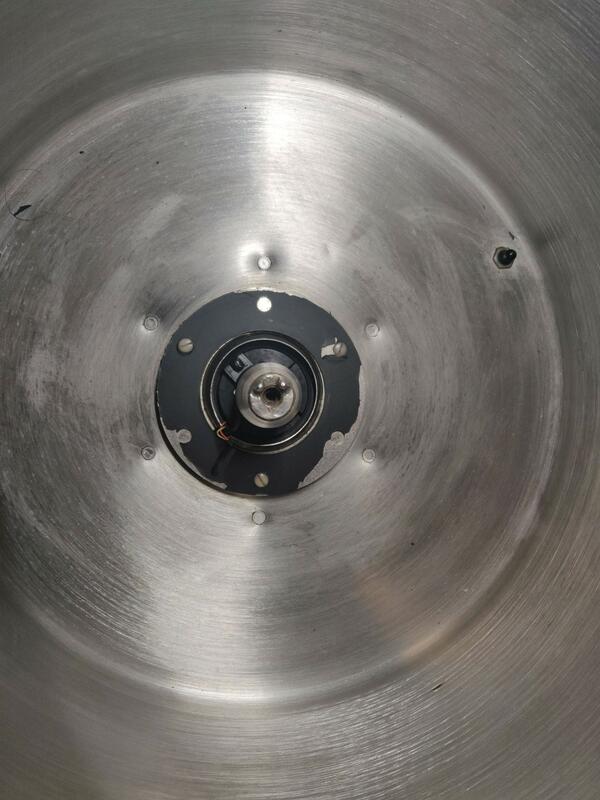 The rotor identification system on an Avanti-I centrifuge is actually a two step process. The first ID happens when you close the lid which sends out a pulse to the rotor handle and If it responds it shows up as the correct rotor on the display. If that does not work properly, which happened all too often, then after you start your run, the centrifuge compares the rotor that you programmed into the run versus the windage and inertia that it calculates at the start of the run. That is why you see the speed go up and down several times and this step also verifies the ID value that the Indala system detected. If it is not finding the correct rotor ID with the windage and inertia then there is something else going on. That is why I mentioned the spacing between the rotor ID sensor and the bottom of the drive hub. The other issue can be with the magnets on the bottom of the rotor. The look like small pieces of metal, which they are, embedded into the rotor. If your JA20 rotor does not have the magnets then that is the problem. Which rotor did you use to perform the W & I calibration? If it was the JA 20 then I am really not sure why you would still be having the problem that you are. OK, I opened the links up in another browser and your JA20 rotor is NOT Indala compatible nor does it have any magnets so technically it should not be used in your centrifuge but that is mostly due to the relatively high age of the rotor itself. Aluminum rotors had about a 10 year life span and your is way older than that but without seeing inside of the rotor pockets or having any idea how much the rotor was used before you got the centrifuge all I can say is use it with caution and probably NOT at its nominal 20,000rpm maximum speed when it was new. Also, your centrifuge was manufactured in 2000. I performed the W & I calibration with tha JA20 but it errored out near the end. If we get this unit working properly again I'll let the users know that they should replace the JA20 if they want to use it. Can the W & I calibration be performed with the JLA16250 rotor? This rotor does have the magnets on the bottom. You cannot calibrate the centrifuge with the JLA rotor. The simplest thing to do since you adjusted the elevation and vacuum pressures is to just reenter the values from the decal where you found the other values if they have changed after your attempts at reinitializing the unit. I previously posted the procedures for that on this database. One other thing that I noticed from the pictures is the absence of o'rings on the JA20 rotor. They absolutely must be in place if runs are to done with open top tubes. 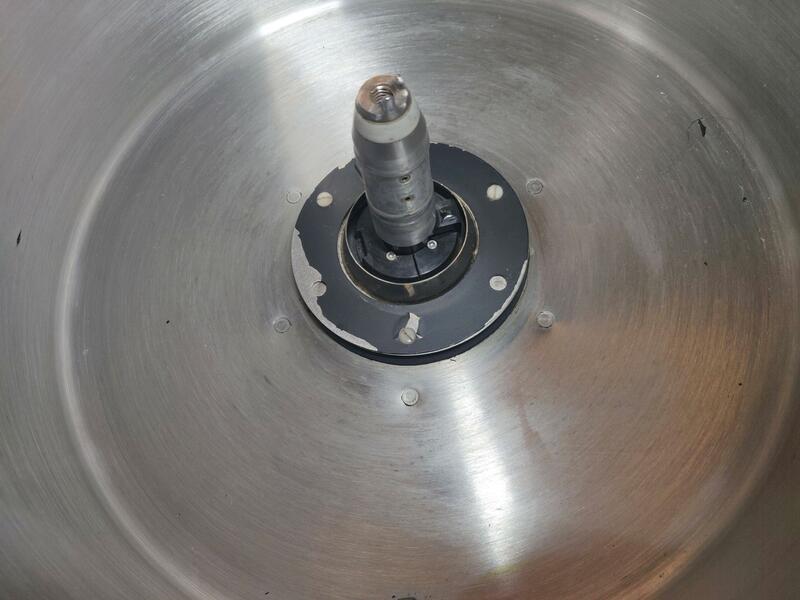 I still believe that you should check the spacing of the rotor ID beneath the spindle. Sometimes a very minor adjustment will fix this kind of problem. In your steps you instruct to enter the 900 to 1900 rpm value, my sticker does not have that value range. I have Inertia, 3k, Windage, Rad. Cal, P4, P6, P8, and P10. Do I have to remove the spindle to check the gap? The 900 to 1900 rom is the inertia value. You do not remove anything in order to check the spacing. You merely insert a feeler gauge set to 0.040" and try to insert it between the bottom of the spindle and the top of the rotor ID module, the black plastic piece that sits underneath the spindle. Just curious but where are you located? The picture is definitely out of focus and there should be two black pieces that are held down with 2 screws on each piece. From what I can make out from the picture, one of the pieces may not be present so how about take a picture that is in focus from both straight on and from a angle that is looking slightly down on the the area at the bottom of the spindle and the black plastic pieces. Good News, after entering in the 900 to 1900 calibration values the unit now reliably intendifies the JLA rotor. Is the gap you refer to the gap between the two plastic pieces? I've gone ahead and taken two more photos that better show the two plastic pieces. Is measuring the gap still worth pursuing if the unit seems to be working properly now? The gap is between the TOP of the sensor, the raised piece, and the underside of the spindle. Nice to hear that the JLA rotor is now working fine. Remember, ALL JLA rotors must have opposing loads even if there are no samples in the empty bottles. By doing this you will provide for a more stable run taking place because it will be a fully balanced load in the rotor. Also, how did you level the unit? Basically you try for a best fit as to leveling by placing the level on the center hub of your JA20 rotor without the lid on. Get the best level front to back and side to side and understand, it is rarely perfect since you only have 2 leveling feet. One other thing to check is the condition of the drive mounts. Your centrifuge is at least 18 years old and by now, if they have not already been changed, they are probably cracking and this can create vacuum problems. There have been MANY iterations of the mounts but the last one that I was aware of over 6 years ago were mounts that were RED in color. They are a pain to change when you have no experience doing so but if they need to be changed then get back to me and I will help you out as there are a few tricks to replacing them.